$1000 in university scholarships, disaster relief for fire victims, and foundations' food scarcity initiative continues. 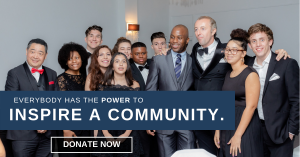 CALIFORNIA, UNITED STATES, April 9, 2019 /EINPresswire.com/ -- The D’Andre D. Lampkin Foundation has published its annual report highlighting the progress of the organization and the impact the Foundations’ programs had on individuals, groups, and communities in 2018. Highlights include the issuance of three university scholarships to high school juniors and seniors, the organization of volunteers and relief supplies following the Woolsey Fire disaster, the planting of 165 trees throughout Ontario, California, and the Social Good Benefit Gala — the Foundations’ first annual fundraiser dinner to recognize donor partners and raise money for programs and initiatives. In 2018, the Lampkin Foundation held its first fundraiser benefit gala where they raised approximately $19,800 for their programs and initiatives. The Foundation also provided $1000 in university scholarships, funded Community Supported Agriculture baskets designed to feed 7 families for 1 week, and recruited 80 volunteers to organize relief supplies and raise monies for southern California wildlife victims. “Thanks to the generosity of volunteers and donors, the Foundation has begun the work of helping people reimagine how they address some of the greatest needs in their community. We are developing initiatives that get people to start thinking critically about ways they can make their community stronger and more resilient and resolve issues together.” said D’Andre Lampkin, Lampkin Foundation Board Chair. Also in 2018, the Lampkin Foundation awarded the first Corporate Social Responsibility Hero of the Year Award to Lowe’s Home Improvement of Ontario for their assistance with the Foundations’ DNA Initiative. Not only did Lowe’s Home Improvement provide supplies needed for the Ontario Community Farm, the company also provided employees as volunteers to assist with beautification projects throughout the city of Ontario. “As a company we do strive for excellence in helping our community. So, it’s nice to receive this kind of recognition,” said Chase Drouillard of Lowe’s Home Improvement, Ontario. “We hope this report encourages others to join and support our volunteer efforts. We are currently in need of reoccurring donors. We are a new Foundation that has kept a lot of promises. Our volunteers have served their communities well. But we still need more donors to expand our programs and initiatives to their fullest potential,” D’Andre Lampkin said.